Once upon a time, I was studying theater to become a production designer, and along the way I designed for a bunch of student and independent productions (and even got to work backstage on some professional operas!). But, that was a long time ago. 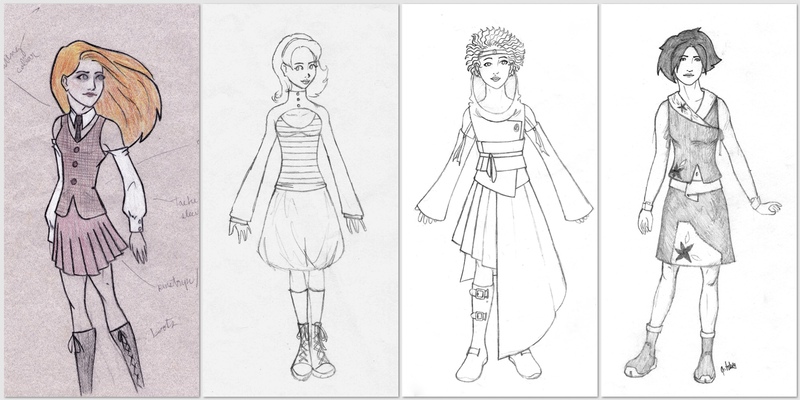 While I was going through a cupboard and packing a box yesterday, I came across a little pile of some of my old costume design sketches and character concept art. I felt rather nostalgic, to be honest, and a tiny, tiny part of me missed those days when I ate, slept and breathed theater. I was also a little embarrassed and proud at the same time; with alternate thoughts of “That’s an awful drawing!” or “Ooh, this one held up well,” or “That’s such a stupid idea!” or “This one is a good idea, I wish I’d had the budget to make that…” I’m always hyper-critical when I find drawings that I did years ago. At any rate, I decided to put any self-consciousness aside and share with you a little blast from my past. These are just a few of the sketches I stumbled across, the ones that are the least cringe-worthy perhaps ^_~ And I suppose it’s fitting to share some costume designs now, even though they’re not very Halloween-y. Give it a click to make it big. What’s something that you used to do all the time but don’t anymore? Do you miss it? Would you do it again? And, Happy Halloween if I don’t catch you before then! You are such an ace drawer!!! Of course, I love the second girl and her outfit- can’t go past hi-tops and stripes ; ) I’d love to see more of your work. Please? Third drawing is my favourite, keep drawing Shy Lion…………. I used to throw pots, alot! Now with a child, I craft with materials that can easily be put down and picked up, every now and then I sit at a wheel and work magic with clay, just to remind myself that one day, I will begin again. Thanks, Pippa! The third one is my favorite too, it’s a sketch for a re-imagining of Ozma from the Oz books. The others are costume designs for shows that I worked on.